Shouldn’t We Know Who Else Is at the ‘Winter White House’? Trump intends to spend a lot of time at Mar-a-Lago. Who is paying to stay with him? 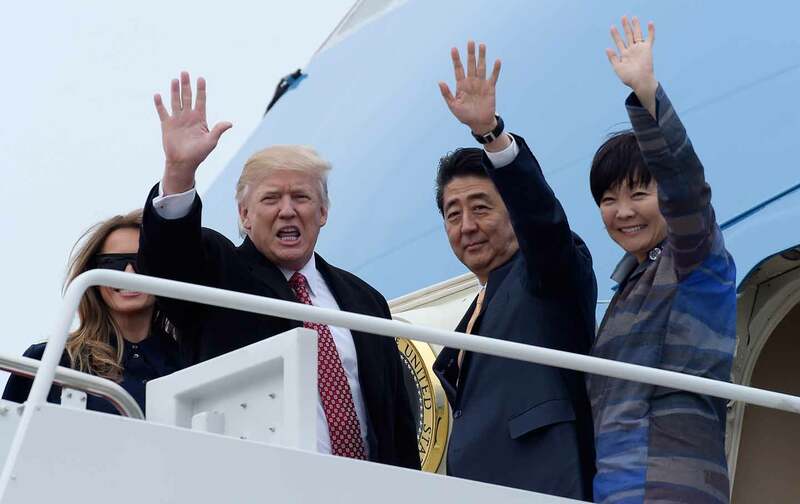 President Trump departed Friday for his second consecutive weekend at his Mar-a-Lago resort, which administration officials have labored to dub the “Winter White House.” He will be hosting the prime minister of Japan for the weekend as a “personal gift” while the two leaders discuss the US-Japanese relationship amidst rounds of golf. White House staff has told reporters to prepare for a presidential trip to Florida every weekend this month—a getaway, perhaps, from the cold humdrum of White House life. But Trump’s retreats also appear to be an escape from the routine transparency and ethics laws of his normal residence. Mar-a-Lago, though now treated as a satellite White House, isn’t being subjected to the same rules as 1600 Pennsylvania Avenue. People can pay $200,000, a fee that was doubled after Trump was elected, to attend the club and rub elbows with the most powerful man on earth. Shouldn’t we know who is paying that fee, and if they meet with the president? These are the questions Senators Sheldon Whitehouse and Tom Udall asked the White House in a letter last week. “Now that you are President, you have an obligation to dispel any suspicions that access to you can be purchased by a private club membership fee,” they wrote. The senators want the White House to make the Mar-a-Lago membership list public, and in particular, Whitehouse and Udall want to know members and visitors to the resort during the times Trump is present. Visitors to 1600 Pennsylvania Avenue are recorded in a visitor log that is public information, and they feel the “Winter White House” should adhere to the same practices. Whitehouse and Udall also want to know what steps Trump has taken to ensure his security at the oceanfront resort, and what internal ethics procedures are in place to determine if any foreign governments or special interests are using Mar-a-Lago membership or visitation as an attempt to influence him. This set-up is straightforwardly problematic: With $200,000 in cash, plus $14,000 per year in annual dues, you could find yourself having a conversation with the president. While Trump does maintain a residence separate from the guests at the resort, he frequently intermingles with guests, even now. Last weekend, the White House acknowledged that the president attended “a few social engagements” at Mar-a-Lago, according to The Washington Post, presumably with other members. The press is largely kept away from the resort, so it’s difficult to know whom Trump interacted with or who else attended these events. The ethical problems would appear to extend to the nearby Trump International Golf Club, where Trump played rounds of golf last weekend, and watched the Super Bowl with members of that club, which is also members-only. Whitehouse and Udall are concerned that special access at Mar-a-Lago is reserved only for elites, not Trump’s famed “forgotten” Americans. “Mar-a-Lago members are the same class of ultra-rich that you’ve nominate to your Cabinet and surrounded yourself with at the White House. Your Winter White House will provide an audience with you for those who can afford it,” they wrote. There is another problem, too: Since Trump has not meaningfully relinquished control of the Trump Corporation, membership fees at the club and the golf course are, in essence, payments directly to the president. “This type of naked profiteering off of a government office is what I would expect from King Louis XVI or his modern kleptocratic equivalents, not an American president,” Norm Eisen, a former ethics lawyer for Barack Obama, told MSNBC recently. If Trump charged big donors or special interests to stay in the Lincoln Bedroom, it would be a big no-no—this was actually a major scandal in the 1990s for Bill Clinton. Several White House staffers were deposed over it. But if someone paid to stay in the Dutch Room at Mar-a-Lago, it’s apparently not going to result in the same scrutiny. And if foreign governments reserve membership for state actors, that could be a clear violation of the Emoluments Clause of the Constitution that prohibits the president from gaining profits from foreign governments. That’s why Press Secretary Sean Spicer repeatedly clarified this week that the Japanese prime minister would pay nothing for his stay at Mar-a-Lago, and that it was a “personal gift” from Trump. A lot of people have snickered about the gaudy attempts to label Mar-a-Lago the “Winter White House,” but that is actually how the resort was once going to be used. Marjorie Merriweather Post, a socialite and once the wealthiest woman in the United States, bequeathed Mar-a-Lago to the United States government upon her death in 1973, explicitly for use as a winter retreat for the president. It remained government property for several years, though President Richard Nixon had a different Florida retreat and never used Mar-a-Lago; nor did President Jimmy Carter. The Carter administration gave it back to Post’s estate in 1980 to avoid paying $1 million in annual maintenance, and the estate put the property up for sale. As Michael Kranish and Marc Fisher write in Trump Revealed, Trump made an aggressive play to buy the club not long after. He low-balled the Post estate with a $28 million offer, which was rejected—but Trump then bought the actual beachfront between Mar-a-Lago and the ocean, and threatened to put large buildings on it and block the view unless the resort was sold to him. The estate eventually relented and sold it to Trump for a mere $5 million, plus $3 million for the estate’s furnishings. Trump has apparently long fancied Mar-a-Lago as a real winter White House, and has improbably made that a reality. But he appears unwilling to apply winter ethics rules, too.